LHC - we have a collision ! LHC – we have a collision ! The LHC had been going on a promising streak for quite a while now; however, the encountered problems (mostly engineering, but also physics) were huge. Imagine firing arrows on the face of the ocean and making them collide – that was the task for the engineers and physicists at CERN. They did achieve collisions before, but this is the first one to reach a significant energy, 7 Tev (teraelectronvolts, which is pretty much 1.6 x 10^-7 Joules; doesn’t sound like much, unless you’re a particle). The previous record was at about 2.36 TeV. Achieving a collision of this level marks the official start of the LHC programme and the next 18 to 24 months are expected to produce trillions of high-energy collisions. So what does this mean ? If they don’t find the Higgs boson, does that mean we’ll have to rewrite physics ? Probably not. It will just show us which of the current competing theories is right. But what happens if they are all wrong ? Well… for the time being, let’s just hope that won’t happen and wait for the current updates from Cern. 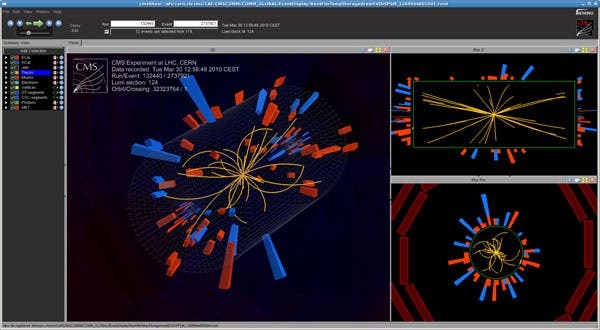 You can watch a live webcast from the LHC , twitter updates or track their status in graphical form. Either way, this collision marks the beginning of a new era in modern physics. Oh, PS : the world is still here.